Sunrise and moonrise created a spectacle for people living in the easternmost coastal towns of Brazil. The umbral shadow then sped east across the Atlantic Ocean and arrived in the African coastal countries of Ivory Coast, Ghana, Togo and Benin. Moving inland, the eclipse track passed over remote areas of Nigeria, Niger, Chad and Libya. Several expeditions traveled into these desert regions to view this eclipse. The weather along most of this eclipse track was optimal. In the Mediterranean, several cruise ships intercepted the moon’s shadow. 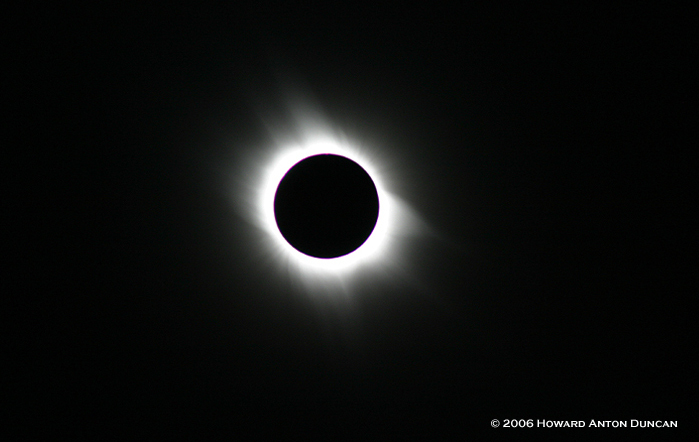 Side, Turkey was another excellent location for many eclipse chasers. The eclipse continued over the Black sea, Georgia, Russia, the Caspian Sea and Kazakhstan ending in Mongolia at sunset.